I finally finished building my first FPV quad. It is a 3S MHQ2 (3D Printed). I built it as a starter quad so I learn the ins and outs, and then can move on to a better quad. Everything is working smoothly, except for one thing: the FPV system. 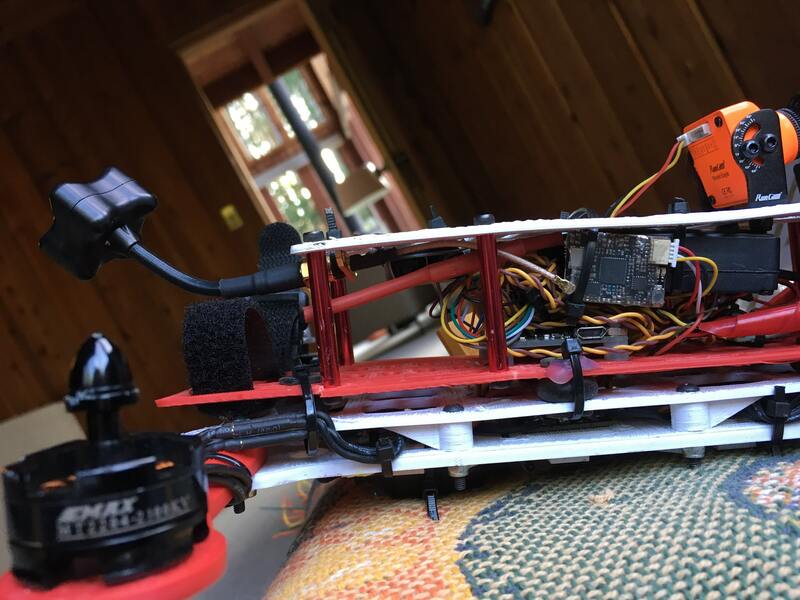 I am using a Runcam Eagle, TBS Unify Pro (Not HV), and TBS Triumph. I am running the Unify on the 25mW power level. For some reason, a few seconds after I start flying, the video signal starts cutting out and I end up crashing because I can't see. I thought that maybe I was getting too far away and needed a higher power level, so I switched it to the 200mW setting. However, as soon as I throttle up to a certain point, the signal immediately cuts out, but returns when I throttle back down. I can repeat this over and over, but each time it will cut out after I throttle to a certain point. Could the Unify not be getting enough power? Could this be a range issue (what should the range be on the 25mW setting?) Could something else on the quad be interfering with the video signal from the Unify? Thanks so much, I appreciate any help I can get. Sounds like a voltage/ground issue. How is everything wired? What flight controller? What pdb, if any? How are the grounds hooked up to the VTX and camera? Is it the Unify Race (25mW and 200mW) or the Unify V2 (only accepts 5V input)? My guess is the regulator you are powering off of cannot supply sufficient amps needed. Its the Unify v2, so it only takes 5v. The XT60 is connected to a very small PDB, which basically just has pads to solder + and -. 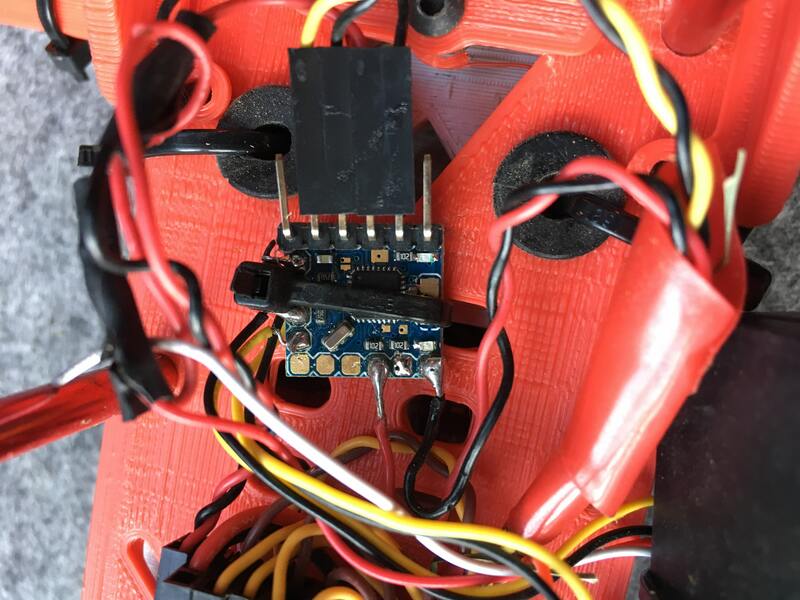 The ESCs, camera, and the 5v step down external UBEC are all connected straight to the battery. The UBEC powers the Naze32, and I am powering my Micro MinimOSD and the Unify v2 off one of the 5v pins by where you connect the ESCs. 3A may be sufficient. Where do you have the ubec connected to the Naze? What camera are you using? Will it take 5V? Your problem may be that your camera and VTX aren't sharing a common ground. 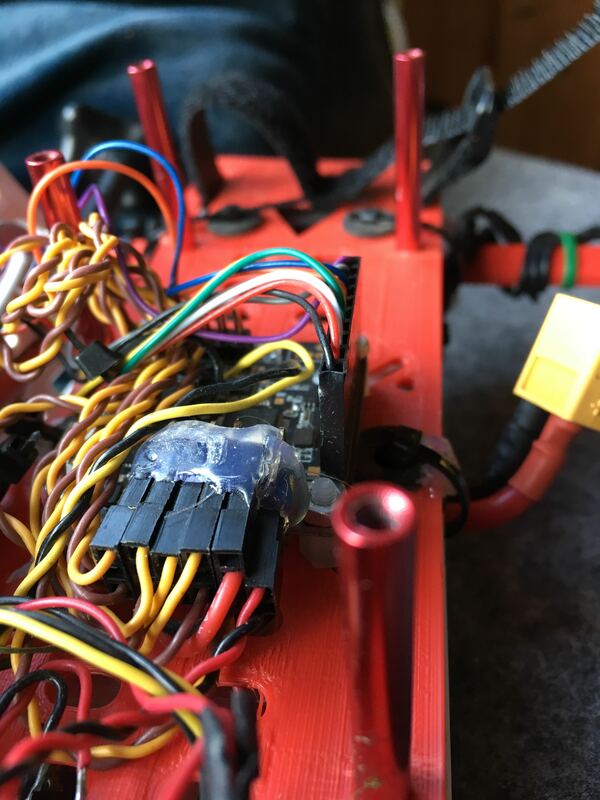 Your camera power has to loop through the OSD, the FC rail, and the BEC to get back to ground. If it were me, I'd try and power the camera off the UBEC too. That may be a lot to ask of a 3A BEC. Yes, those wirings are correct, except that the Unify is also grounded on the OSD. Also, I wanted to clarify that the Unify and the OSD are powered off the same 5v pin on the Naze... could this be the issue? And wouldn't powering the camera off the BEC put more load on it? What if I grounded the camera straight to the battery? I would power the FC off the 5v pads on the pdb. Then pull power for the video system off the ubec wired to the battery. The FC only out puts half an amp I believe. Psyborg, if I understand correctly, his pdb doesn't have a 5V regulator. It's only full battery voltage. Ludwant, maybe try adding another ground wire from the OSD to the battery negative. Maybe that will reduce the issues with the camera. Have you range checked your video? Is it strong up close, but when you walk away is it weak? Maybe you have an RP-SMA on the antenna, but a regular SMA on the VTX. Can you post pictures? 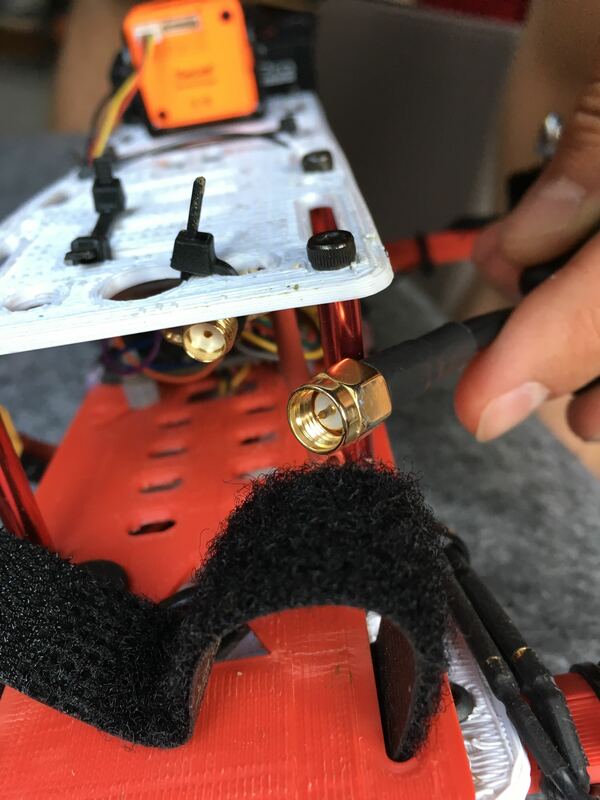 Would be nice to see all your wiring at work, and good detailed pictures of the innards of your VTX and antenna connectors. It still boils down to the fact the internal voltage regulator in the NAZE is spec'd for 500 ma which is not enough to power what he is trying to do. I would parallel it all off the BEC and not run anything thru the Naze since its a 3 amp rated and should be fine. Thank you so much for all the replies! The video does work long range, it just cuts out after maybe 20-30 sec of flying. I double-checked, both the Unify and the Triumph have SMA connectors. For some reason, the site is not letting me upload pictures (it keeps saying upload failed). So, if I powered the OSD and Unify straight from the BEC, that should solve my problems, since it isn't overloading the Naze? Can I still ground them on the Naze, or should they be grounded on the BEC as well? Try scaling the pictures down < 1000x1000. That should make sure that they are not too big, which will cause problems. Ok, I got it, thanks for the tip Montley! You can see the connectors for the Unify and Triumph, the OSD connections, the connections to the Naze by the motors, and the placement of the Unify and the antenna in the quad. Sorry; my wiring is a mess, I'm planning on moving the parts to a better frame and clean up the wiring soon. BEFORE you even attempt to power that back up mate I would SERIOUSLY cut that red wire down (last pic on the osd) to where the insulation is as close to the board as possible. That's a dead short begging to happen. The video wires look suspect on the left side of the OSD board too. And they are covered by a zip tie. Could be hiding a short. The FC and power wires plugged in to the top of the OSD board don't look plugged in all the way. Ok, thanks for the tips. I'll try paralleling everything from the BEC, so as not to overload the Naze. What do wall sockets taste like?